For the first time since last spring, I actually considered putting on a jacket to start the morning. The temps were in the mid 60s with a cool breeze blowing through the air, which was a nice change from the heat we’ve had this summer. Johnathan Meadows and I were fishing the last event of the 2015 Lone Star Kayak Series on this morning and were patiently waiting for the clock to show 6 am so that we could begin our day. We were the only two people at our launch, which in my opinion is always a small advantage on tournament day. We wouldn’t have to worry about dodging other anglers that were fishing the tournament or miss out on fishing certain areas because someone else arrived first. I’ve spent 99% of my kayak trips sitting in the seat of a Jackson Cuda 14, but on this particular morning I decided to go with the Cuda LT instead. The marsh we were fishing consists of several dozen small lakes that go on for as far as the eye can see. With the Cuda LT weighing in around 20lbs. lighter and a little over a foot shorter than my Cuda 14, I decided to go with the kayak that had the ability to make sharp turns without needing a lot of space. We pushed off into the dark at 6 am and made the short paddle to the first lake we planned to fish. Johnathan started off throwing a topwater while I went with a popping cork and gulp. The plan was to throw different set ups to see what the fish were wanting and then both go with the lure that was producing more fish. 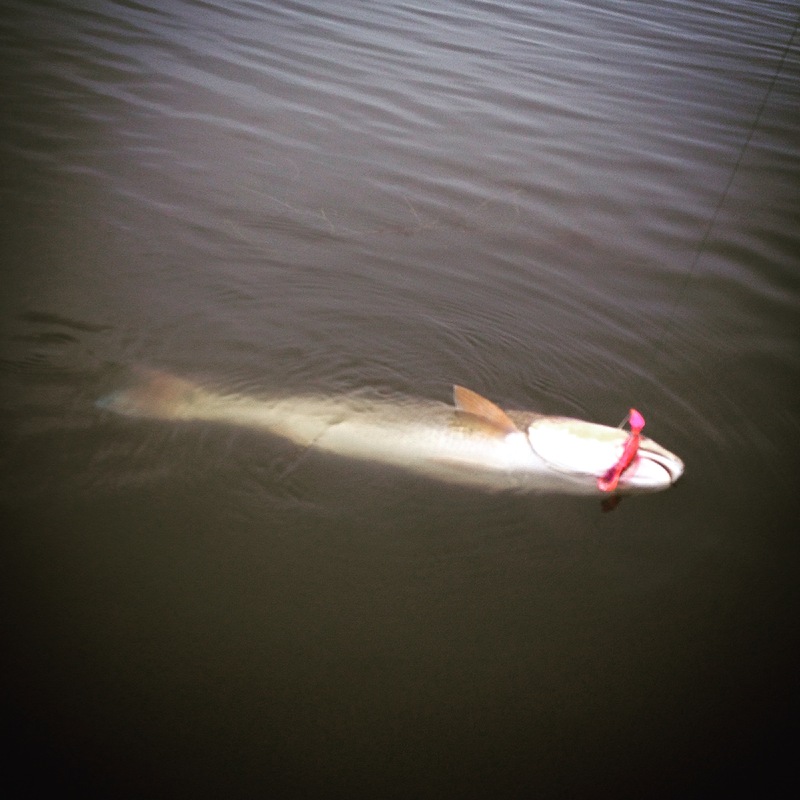 It didn’t take long before I had my first bite on the cork which turned out to be a solid 26 ½” redfish. A few minutes later I had my second bite of the day, a chunky 25” red which gave me two fish on the stringer before the sun had a chance to peak over the horizon. Anyone that has ever fished a tournament knows how good I feels to have 12+ lbs. on the stringer within the first hour. It was obvious that it was going to be a popping cork kind of day with the higher than normal tides, so Johnathan put down the topwater and grab his rod with the cork on it. Anyone that’s in the market for a good popping cork rod that won’t break the bank should check out the Hook Spit Zephyr Elite. At 7′ 2″ you can make those long casts and pop a cork the way its meant to be popped wit the extra fast tip. It’s a great popping cork rod priced at $159. It didn’t take long before we figured out the pattern for the day and both had fish two fish on the stringer. With a decent NE wind blowing through the marsh, we used it to our advantage by focusing on all points and small coves on the windblown shoreline. 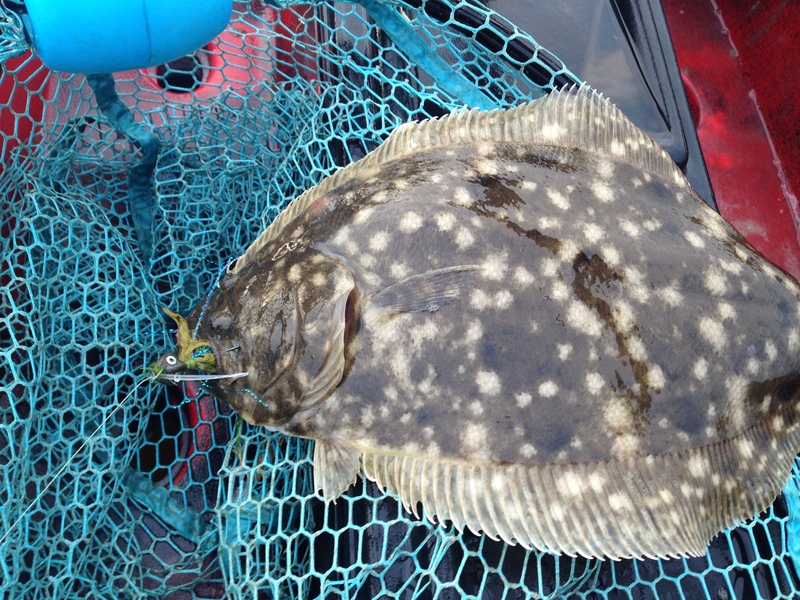 It seemed like every point held at least one fish, along with any small cove that was located on the SE shoreline. The reds would wait on the wind protected side of the points and ambush the bait as the current forced it by or they would focus on the bait that was unwillingly being pushed up against the shoreline by the wind. At one point we thought we had doubled up on two solid reds, but come to find out, Johnathan had a 27 ¾” red while I had a two foot alligator. It didn’t take long for the gator to realize what was going on and make a mad dash for the protection of the tall grass on the shoreline. He hit the bank and never looked back, eventually slicing through my leader and letting me keep my cork. Shortly after the gator broke me off I was able to sightcast a 30” red by standing up in the LT and letting the wind push me towards the tailing fish. I could tell this fish would be out of the slot, but who can resist sightcasting a 30” red in a foot of water. Johnathan was able to catch an oversized red a few hours later as it and a couple of other fish were barreling down the shoreline destroying any bait in their sight. We ended the day each catching more 6 lb. reds than we could count, our two oversized fish, and a few larger ones that stayed in the slot and made the trip to the weighin. In the end, Johnathan took home 1st place out of 96 anglers with 15.56 lbs. while I finished 6th with 13.15 lbs. Congratulations goes out to Jason Blackwell who took home Angler of the year honors once again, giving him his third AOY trophy in as many years. I’d like to give a huge thanks to Werner Paddles, Hook Spit Performance Rods, Buggs Fishing Lures, and Jackson Kayak at this time. These companies provide me with quality products that have helped me become a better angler over the last several years. I am truly blessed with the opportunity to represent them and look forward to doing the same when the 2016 tournament season kicks off. On a side note, the Lone Star Kayak Series will be back again next year, but the tournament owner and director will change. Dustin Koreba has decided to step down and hand it over to Cameron Barghi and Justin Rich. Cameron and Justin already run the Saltwater Survival Series and have been a part of the LSKS team since it began 4 years ago. We can expect a new beer sponsor and a few new lures, but overall, the things that make this tournament so special will remain the same. Now we all have to fish against Dustin instead of accepting prizes from him. I’ve often heard other tournament anglers say, “If you don’t have your fish by noon, odds are you’re probably not going to get them”. 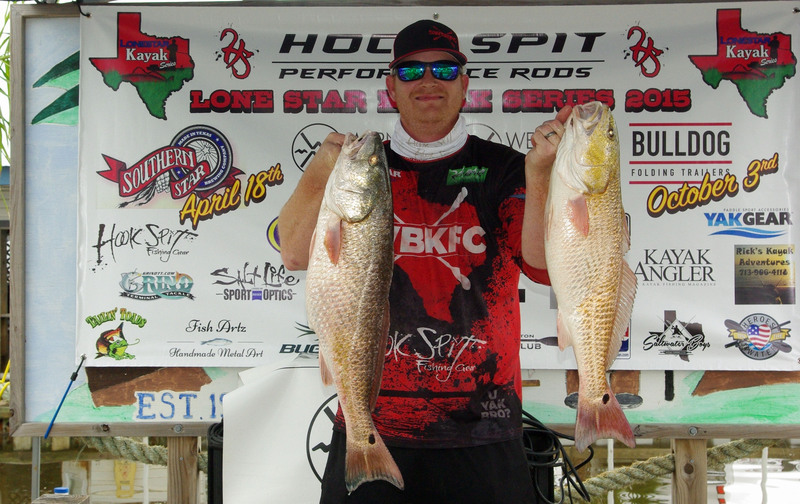 Although I would never give up while fishing a tournament, I have to admit that little saying had crossed my mind a couple times the other day during the Hook Spit Lone Star Kayak Series. This was the third event of the season, and for the first time this year, I felt pretty good about my odds of doing well. The wind wasn’t bad, we had sunny skies, and I had been on some solid redfish over the last few weeks. Shallow patches of shell and soft mud bottoms had produced a good amount of redfish during the beginning of August, so I decided to stick with what had been working. The majority of my fish had come from a popping cork with gulp, with the rest coming off of a soft plastic that I would use to sight cast singles or pitch into a school. Plan A was to locate the schools that had been roaming the area in recent weeks, but they were nowhere in sight. After spending a good hour trying to locate the school, I decided to head for shallower water with plenty of shell. I made a long drift across one of the larger lakes, staying within 30 yards of the shoreline, and on the edge of the large shell patches. I sight casted one small redfish along the shoreline before deciding to try the opposite side of the lake, which happened to be the wind protected shoreline. As I approached the protected shoreline, I immediately noticed a few mud boils pop up, which was a good sign. I fan casted the area for a few minutes and hooked up with what felt like a solid fish. Five seconds into its first run, it spit the hook, leaving me with a sick feeling in my stomach. I decided to stay on the move, trying to spot more fish to cast at, but didn’t have any luck. I didn’t have much time left to fish, so I decided to work a small channel as a last ditch effort. I had one lower slot red on the stringer after seven hours of hard fishing, so the odds that I would pick up my second fish were looking pretty slim. The channel only produced a few rat reds so I decided to fish my way back to the truck. I had only made it about 20 yards across the main lake when I spotted a group of birds hovering a few feet above the water about a half mile away. I knew these birds were on a school of fish, and that this was the best chance I’d have at picking up a much needed second fish. I caught up with the school after a five minute paddle and with one cast, I went from 41st to 9th place, thanks to the 26 1/4″ red that pounced on my soft plastic. The fish weighed in at 8.09 lbs. and ended up being the heaviest fish of the whole tournament. My two fish had a combined weight of 11.70 lbs. and helped me bring home a small amount of cash and a few prizes. The fishing wasn’t hot and heavy on this day like it had been during my previous trips, but that’s how fishing goes. Still, I had a great time and enjoyed visiting with friends at the weighin. We have one event remaining this year in October and I’m looking forward to it. David​ and I hit the water yesterday morning and found the flounder going airborne on small baitfish in a foot of water. They weren’t easily fooled by lures but we managed to string a few. Mine came on Buggs 1/4 oz. Curl Tail jig (Black Gold) while David went with Chicken Boy Bubba Cluckers. After the flounder action died down, it was off to search for redfish. The water was extremely dirty which meant gulp shrimp under a popping cork with the Hook Spit Zephyr Elite rod. If you’re looking for a popping cork rod for a spinning reel that is designed for a cork, this one is worth checking out. We focused our efforts on the edge of large patches of shell with a one foot drop off to a soft mud bottom. Popping the cork parallel to the edge of the shell produced a little over a dozen reds for me along with a small black drum. David ended up with 3 flounder and about a dozen reds as well. It was a fun day on the water with a good friend. 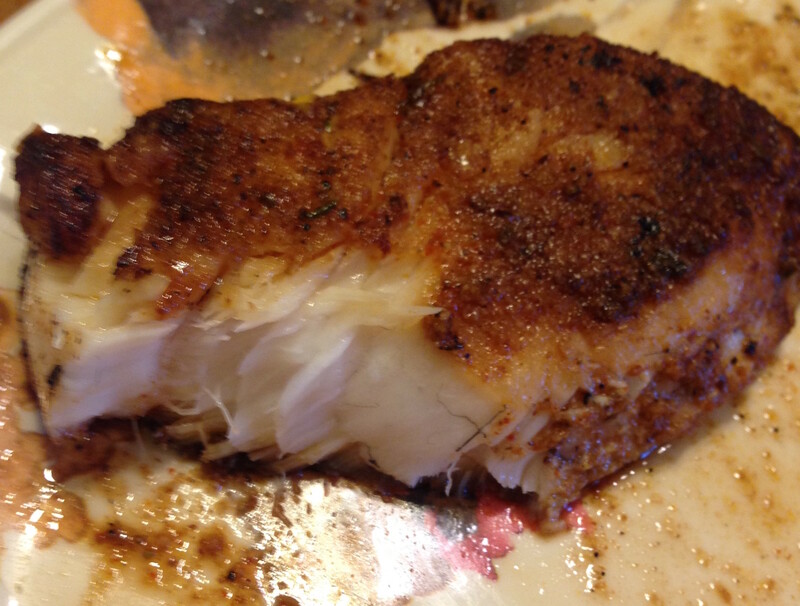 Once I arrived back at the house, I decided to blacken the flounder instead of stuffing it. I was amazed at how well it turned out. Needless to say, it may be a while before I stuff one again. The clock on the dash of my truck shows 5:31, but I know it’s not accurate. I keep it set eight minutes faster than the actual time, which means I’ll reach my destination a few minutes ahead of schedule. That’s not uncommon since I always seem to wake up before my alarm goes off on mornings when I have a fishing trip planned. As I approach my launch site, I do a quick scan of the area to see if my headlights reflect off of any other vehicles. They don’t of course. It’s rare that they ever do since I do my best to arrive before anyone else. Beating the crowds is nice, but I don’t like to miss the sunrise as it peaks over the horizon. That’s where it always looks the best. I slowly back my truck up to the edge of the water and fumble through my gear for the can of Deep Woods Off. On this muggy Texas morning, the winds are non-existent, which means the mosquitos will be out in full force. I douse myself in the insect repellent before opening the door, but know it will only do so much. Marsh mosquitos are tough, and I often think they view the spray as a marinade being applied to their next meal. I exit the truck and begin the mindless task of unloading my kayak and gear. I’ve performed this task several hundred times now, so within 10 minutes of arriving, I am on my way. It’s still pitch black outside, so I turn on my 360-degree light, even though it won’t serve a purpose on this particular morning. It’s way too shallow for powerboats to reach the spot I’m heading to, so the odds that I’ll become a speed bump in the dark are nonexistent. I have roughly thirty minutes before first light shows itself, which is more than enough time to complete the one-mile paddle required to reach my destination. I keep my pace slow and steady, while carefully listening to the sounds of the marsh. It’s quiet at first, and the only sounds I hear are the occasional splashes made by jumping horse mullet and few noisy seagulls. Then, off in the distance, I hear something else. The distinct flushing sounds that only feeding redfish make. I don’t quite know the exact location, but turn the bow of my kayak in the general direction of the noise. Even if I am unable locate this particular group of fish, it’s these types of sounds that get my adrenaline flowing for the day. As I approach the area where I believe the fish had been feeding, I stop and wait, hoping that they will eventually give themselves away. They don’t of course, so I fan cast the area with my topwater, hoping to get lucky. Three casts into the small cove results in zero blowups. The fish that had been in the area just moments before seem to have vanished all of a sudden. As the sun inches closer and closer to the horizon, my vision slowly improves. A quick glance at the shoreline confirms what I already know. The tides are extremely low this morning, with a good six inches separating the top of the water from the bottom of the grass. Bait has very few places to hide right now, so the marsh birds are having a field day. 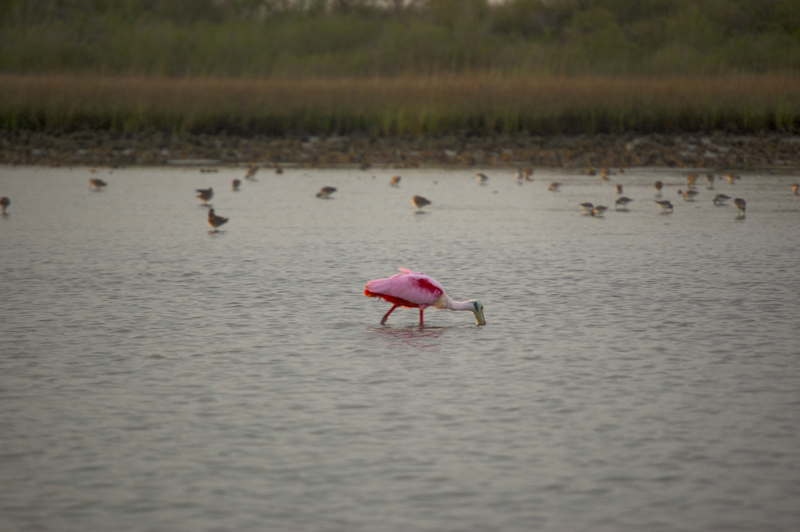 I watch a few Rosette Spoonbills as they swing their bills back and forth through the water in search of the tiny shrimp that are burrowed in the mud. I don’t spend too much time watching though. I have approximately two hours before the tide turns and begins rushing back in, so there’s little time to waste if I want to sight cast a few reds. At times I’m paddling through 8” of water, but on occasion I hit an area so shallow that I’m forced to pole myself through what feels like more mud than water. As I paddle, I do my best to remain in the center of the narrow channel that leads to the back of the lake. If I’m not careful, I could stray off course and be forced to walk through knee-deep marsh mud, which is not my idea of a good time. This area is really shallow, but I know that I’ll find slightly deeper water and plenty of fish if I can just make it a little further. After another hundred yards of carefully navigating my way through the maze of mud, I finally reach a consistent depth of one foot and my search begins. I have four rods with me, just like I would on any other day. One has a topwater; another has a popping cork, the third has a soft plastic, and the fourth is equipped with a ¼ oz. Beastie Bugg. The cork, topwater, and soft plastic will more than likely not see much action today, but the Bugg is sure to get a workout. If I catch any redfish this morning, it will be because I can see parts of, if not the entire fish. After all, the low tides and exposed fish are the main reasons I chose to fish this particular marsh this morning. The first area I approach is a small grass flat that has held good fish for me in the past around this time of the year. Crabs, shrimp, baitfish, and numerous other creatures’ call this area home, and use it as a hideout from would be predators. The redfish know that, and don’t seem to have a problem with putting in a little work for their food. I start off by circumnavigating the football sized patch of vegetation, focusing on the edges of the grass. I’m hoping to spot a few reds as they slowly move along the perimeter looking for their breakfast. I’ve always had a hard time focusing on one area for an extended period of time; so naturally, I divide my time between watching the edge of the grass and looking out towards the middle. I’ve spent several years training my eyes to subconsciously look for signs of redfish in shallow water, but so far, I am unable to locate any fish. Large mullet in the area continue to jump, but the sound that their splashes make receive no attention from me. Just like my eyes, my ears know what to listen for, so I’ll only jerk my head around if I hear the obvious sound made by redfish smashing bait. After slowly covering a good fifty yards of water, I finally spot what I’ve been looking for. 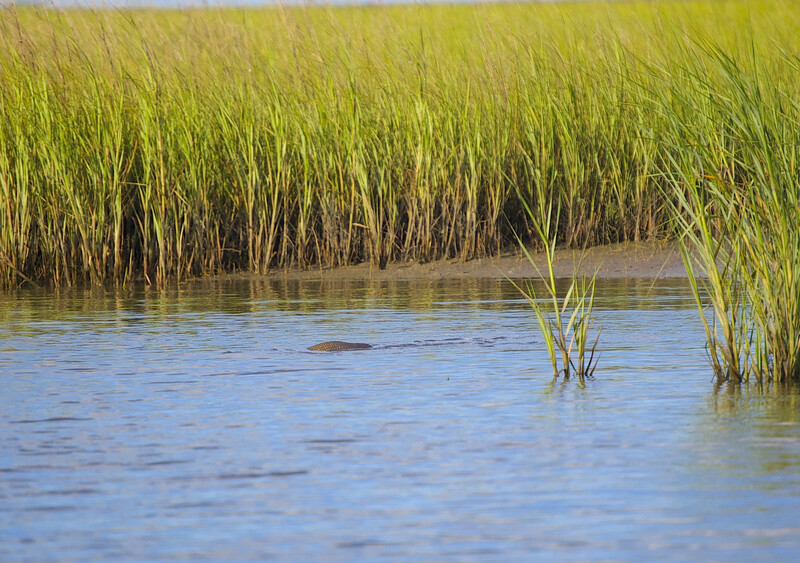 A dozen redfish tails are sticking a few inches out of the water in close proximity to one another, as they rummage through the grass for small crustaceans. I’ve witnessed redfish in this setting a hundred times before, but it never gets old. My heart starts racing, the excitement overwhelms me, and it’s like I’m seeing it for the first time again. In the past, I would have paddle straight towards the fish, and fired a cast off in the middle of them as soon as I reached the outer limits of my reels casting capability. More times than not, that cast would miss its mark, and the fish would scatter. My past experiences let me know that those fish aren’t going anywhere anytime soon. It has taken a while, but I’ve learned that a little patience combined with a stealthy approach will almost guarantee that I catch one of these fish. The fish are moving slowly, but they are moving, which means the direction they are heading is important. I watch for a few seconds and determine that they are moving directly away from my current location. I take my time and slowly paddle around the right hand side of them, making sure to stay a good 15 yards away at all times. In all honesty, I’m not even paddling water to move my kayak. Instead, I am placing the blade of my paddle into the soft mud, and propelling myself forward by pushing against it. This approach is a littler quieter, and it allows me to get within casting distance of the school without giving myself away. A few minutes have passed now and the fish are still unaware of my presence. They are devouring shrimp and crab without the faintest idea that one of them is about to be yanked from their little group. Half of me wants to spend a few minutes watching them feast, while the other demands that I make an immediate cast. I only take a few seconds to decide, and the half that is begging me to make a cast wins. It’s been too long since my last trip and I need to feel that tug on the end of my line. I pick up my rod with the Bugg, double check the direction they are heading, and release a near perfect cast that lands three feet past and three feet in front of the school. The Bugg lands softly and matches the size and color of the fleeing shrimp perfectly. Not a single fish spooks, so I know what is about to happen. I let the Bugg fall for about 3 seconds so that it reaches the bottom where the fish are feasting, give one twitch, and feel that familiar thump I’ve been waiting for. I reel down my slack and lay into the fish with a powerful hook set. At this point, all hell breaks loose. The unlucky red that has taken my bait bolts from the group, the remaining fish scatter in every direction, and my reel begins playing that sweet music that only a fisherman can appreciate. I begin what will probably be a 2-4 minute battle with the fish, but in all honesty, my favorite part is over. I enjoy fighting the fish as much as the next guy, but my favorite thing about sight casting, is the eat. I love seeing the fish pounce on my bait, feeling that hard thump, and experiencing those first five seconds of ninety mile per hour drag peeling as the fish races away, leaving behind a massive wake. It’s what keeps me coming back for more time and time again. Three minutes have passed now, and the fish has made a couple of extraordinary runs, but with little energy remaining, he has accepted defeat. I reach over the side of my kayak and bring my opponent onboard. It’s a solid red at 25” with a beautiful bronze color. The Bugg did its job and ended up in the corner of the fish’s mouth. After a few wiggles back and forth, it comes free, leaving the fish unharmed and ready to rejoin his friends. I gently slide him over the edge of my kayak and back into the water while holding him by the tail. I’ll hold him here until he pulls away on his own, which occurs less than ten seconds later. With a powerful wave of his tail, he splashes me with a little water, his idea of revenge I’m sure, before disappearing into the grass. I spend the next few hours repeating this process and landing a handful a fish. The incoming tide has now ruined my skinny water and temperatures have already climbed into the lower 90s. I’ve scratched my redfish itch for the day, so leaving a little earlier than planned doesn’t bother me on this particular morning. I head back to the truck and no longer have to worry about getting stuck in the mud. The water is even with the bottom of the grass now, so I am able to paddle anywhere I choose. As I arrive back at the truck, I am greeted by a couple of kayakers that have just returned from their morning trip. They don’t have a drop of mud on them, and I am completely filthy. It turns out they were heading for the same general area that I had fished, but quickly decided to change plans upon arriving because they said, and I quote, “There just wasn’t enough water for the fish to be back there”. Instead, they opted to fish a nearby deeper channel without any luck. I can’t help but laugh a little and tell them that an area that’s too shallow for redfish doesn’t really exist. I describe the events of my day and tell them about everything I had to go through to reach my spot. I tell them about the schools of fish and show them a few pics on my phone. From the looks on their faces, I can tell that they are trying to decide if my story is true, or if I’m sending them on some wild goose chase to protect my honey hole. I encourage them to give it a try one morning and they say they will give it some thought. For those curious as to why I spend so much time in the shallow Texas marsh, this recap of the day’s events sums it up. Watching the sun rise, listening to the sounds of nature, covering several miles of water as I search for fish, and seeing them pounce on my lure is a combination of events that makes it all worthwhile. There are several different opportunities out there when it comes to selecting an area and species of fish to target, but for me, redfish in the marsh tops them all. 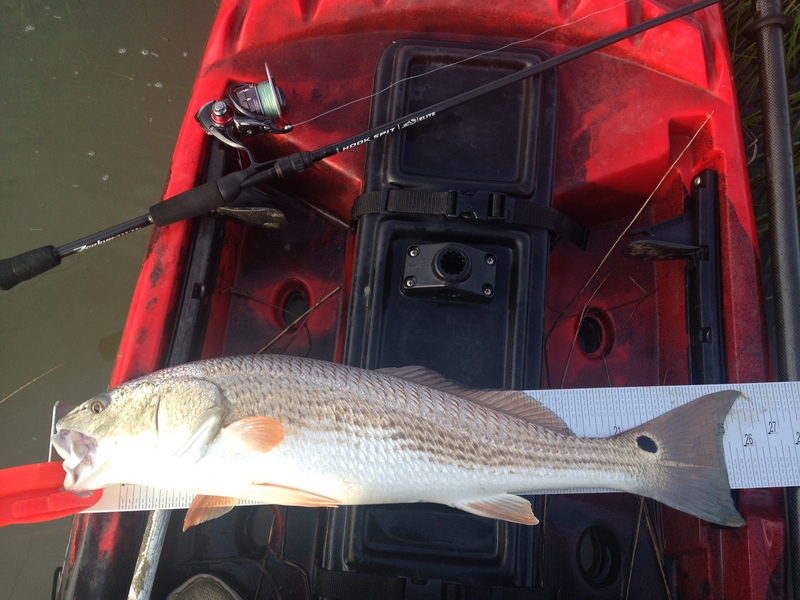 Don’t be afraid to go shallow – Redfish will swim through water that even your kayak can’t float through. If you choose not to fish a spot because you think “there’s just not enough water”, you could be making a big mistake. Constantly use your eyes and ears – In water this shallow, redfish will often give themselves away if you know what to look and listen for. Tails, backs, wakes, fleeing bait, hovering birds, or one tiny shrimp can be what leads you to the fish. Use patience when you locate a fish – Often times, anglers get so excited when they see a visible fish that they will make a cast as soon as possible. Take a minute or two and observe the fish. See which direction its heading, determine whether it’s aggressively chasing bait, and if so, what is it eating. 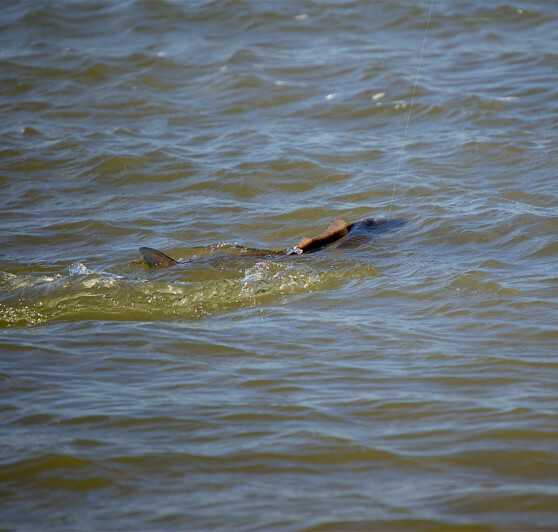 Also, enjoy the sight of watching a 25” redfish as it swims through a few inches of water. There are plenty of people that will never experience that. 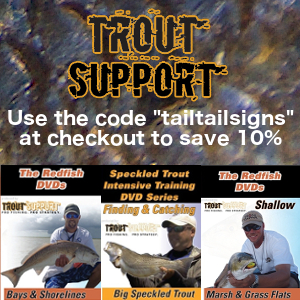 Expect fish to be spooky – Redfish in really shallow water are normally pretty spooky. Using small baits and casting past and in front of the fish by several feet is usually required if you want to keep from scaring them off. Once the lure hits the water, very small twitches will help to draw attention to your lure without spooking the fish. I know its been a while since my last blog post, but unfortunately, that trend will continue for a while. My wife and I are less than a month away from the arrival of our 2nd child, so fishing trips have been few and far between, and time to write or do anything else fishing related has been difficult to come by. We’re excited about the arrival of our new little one though, which should happen sometime in mid May. 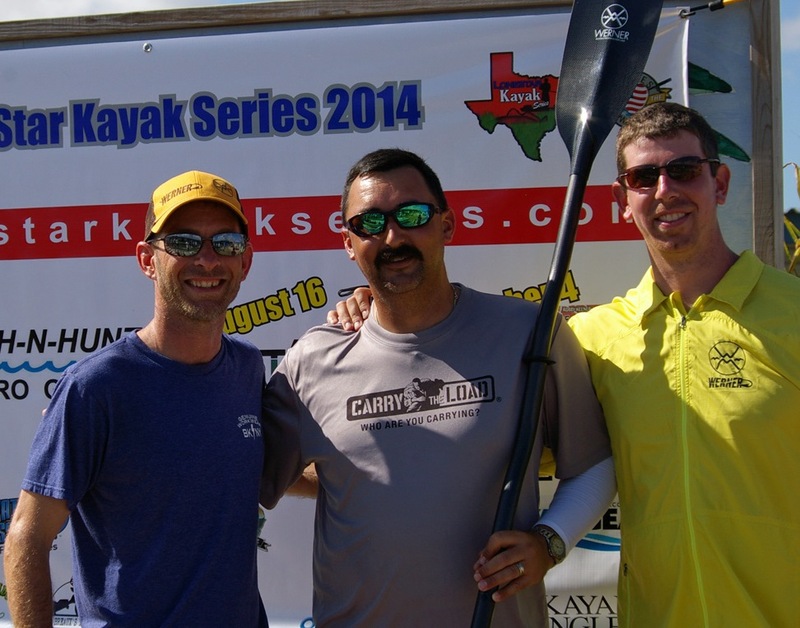 The first event of the Lone Star Kayak Series was held this past weekend and man was it a big one. 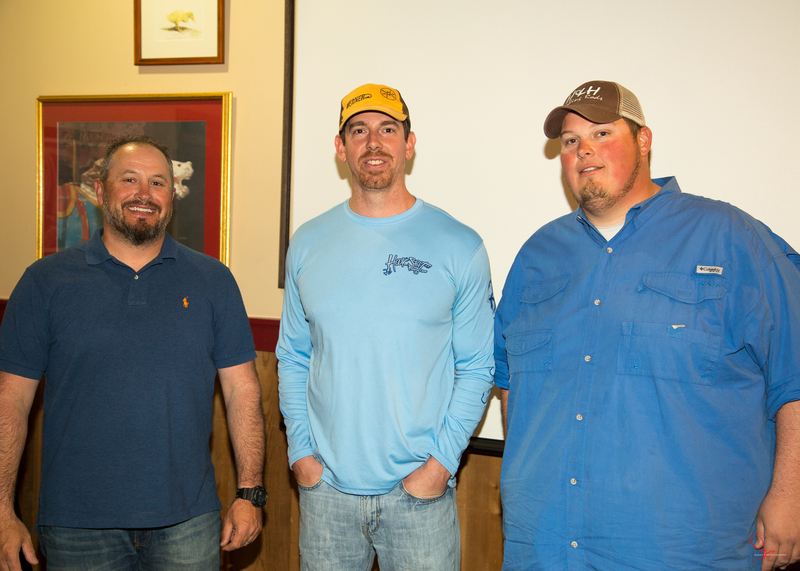 The largest event last year occurred during the first event in April and included 91 anglers. With the tournament continuing to grow in popularity each year, we had high hopes of breaking the 100 angler mark for the first time ever. When registration was finally shut down, we couldn’t believe what we were seeing. 176 anglers had registered for the first event of the season which nearly doubled the previous best mark. With tourney day quickly approaching, I decided to take off work on Friday to try and locate a few fish. I’m not a big fan of fishing the day before a tournament, but the location I chose was based off of past experiences and current weather conditions. I had no clue if the fish would be around and wanted to check it out before showing up the next morning. We’ve had rain for nearly two weeks straight leading up to this event, and most areas were running extremely fresh as far as salinity goes. On top of that, we had pretty strong SE winds that were causing our tides to run about a foot higher than predicted. I would much rather fish a really low tide than an extremely high one, but that wasn’t going to happen this day. I launched around 7:00 am on Friday morning and made the one mile paddle to the spot I planned to fish. I only spent about 2 hours fishing, but caught a decent 27″ red, missed another, and also caught an 18″ rat red all while using a Midcoast Popping Cork (Texas Swing) with a New Penny Gulp Mantis Shrimp. Only one good fish was caught, but it at least let me know there were a few in the area. I made it back to the truck around 10 and was on the road headed home. My alarm went of at 3:15 am on Saturday morning and I was on the road by 3:30. After a quick stop at Bucee’s where I met up with David and saw a few other friends, we were on our way to the launch, breakfast burritos in hand. We arrived around 5:30 and unloaded our gear with plenty of time to spare. The phone alarm went off at 6:00 am and we pushed off a few seconds later doing the best to leave the mosquitos behind. We reached our first spot around 6:30 as first light began to show. We could hear bait being smashed along the grass lines and thought for sure we had chosen the perfect spot. We both worked the edges of the grass with corks and gulp, but neither of us ever got a bite. The feeding frenzy was short lived at around 15 minutes, before going completely quiet. We continued working the grass lines with the exceptionally high tides before working a couple of drains with only one rat red by David to show for our efforts. After a few hours of solid cork popping and no bites, I decided to move around and check out some other areas. I made a short paddle to another lake and worked the grass lines first, followed by a narrow channel that runs through the small lake, and then the shell in the middle with no bites. 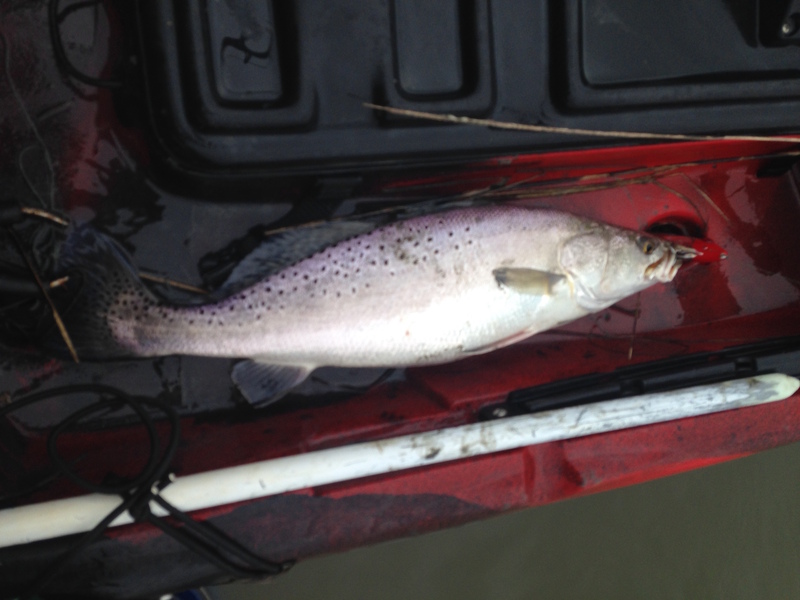 I was about to head back toward David but decided to cork a small drain where a few small baitfish were flipping. A few seconds after casting into the drain my cork shot under and I was rewarded with a 23″ red. Not quiet the one I was looking for, but it gave me a fish on the stringer, which is always a good feeling on tournament day. After stringing that fish, I started hearing feeding fish over my shoulder where a series of endless islands and channels were weaving in and out of each other for a good half mile. I started working my way through the drains, hearing bait getting busted about every minute or so. I had difficulty locating exactly where the feeding was taking place while sitting down, so I decided to stand and pole. Once standing, seeing where the commotion came from was easy to spot. I stuck with the cork and gulp, making casts into the areas where the bait had been hit, and then making small pops of the cork to draw some attention to my bait. After several casts that I thought for sure would yield bites went untouched, I decided to switch lures. I had started getting glimpses of the bait being hit and they were very tiny shrimp about a inch in size. I snipped off my topwater, tied on a 1/4 oz. Curl Tail Bugg (Hot Pink), and made a cast into the area where bait had just scattered. The Bugg hit the water, I gave it one twitch, and the redfish unloaded on it. I landed this fish in about 10 seconds due to the fact that it ran into the grass, causing it to become stuck. I picked up the fish and thought I had just hit the jackpot. After stringing the fish, and laying it on the Checkit Stick, I quickly realized that my fish was going to be out of the slot. Once I pinched its tail, it measured 28 1/4″ which put it 1/4″ over the slot. It was a tough blow going from a 13 lb. stringer, back down to 4.73 lb. because of 1/4″, but thats how tournament fishing goes. I worked the area a little longer, but just like earlier in the day, the bite died off after about 20 minutes. I made my way back to David to let him know about the two fish I had landed and continued working the area near him. I picked up an undersized red and extremely fat 22″ trout before I decided to head back to the area where the previous fish were caught. We made our way to the small lake where I had caught my 23″ red and stopped to fish a small flat near a drain. I was halfway through with a story about how a friend and I had caught a good number of reds on this flat our first trip to this area several years ago when David’s Pink She Dog was annihilated by what sounded like an extremely large fish. I paddled away from him to make sure his fish didn’t tangle up with my kayak and returned 5 minutes later to check out his fish. He asked me to give him a 2nd opinion on the length because he was having some difficulty determining if the fish was right at, or barely over 28″. After a pinch of the tail it was clear that his fish was 28 1/8″ in length giving David the same heart break I had experienced just an hour earlier. We continued working the area but knew we were running short on time. On our way back to the truck, David picked up a 24″ red on the same She Dog which meant he wouldn’t be going to the weighin empty handed. I desperately tried picking up a second fish and thought I had succeeded when my She Dog was hit hard less than half a mile from the truck. To my surprise, it was another extremely fat trout. We made it back to the truck and headed to the weighin to discover that some monster weights were holding down first and second place. 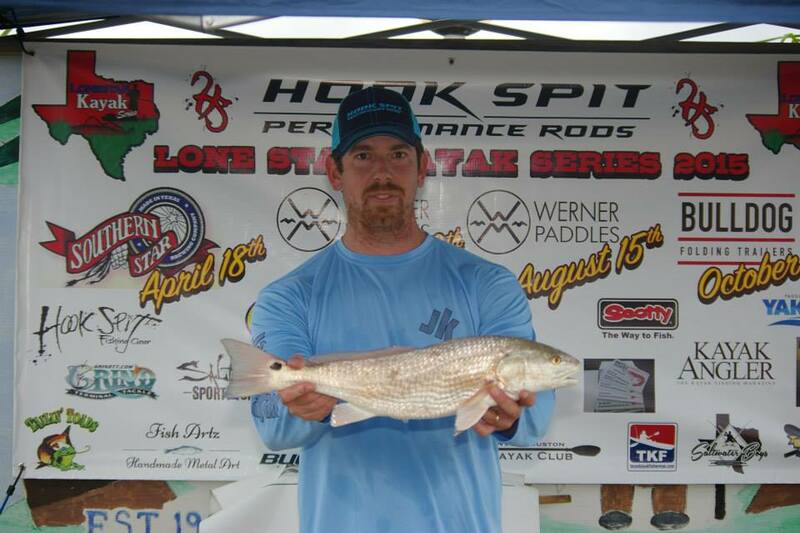 Joe Strahan from the Saltwater Boys Kayak Fishing Club out of the Beaumont area had 18.25 lb., which included his 1/2 lb. live bonus. Closely behind him was another SWBKFC teammate, Brent Louviere with 17.15 lb. (1/2 lb. bonus included). 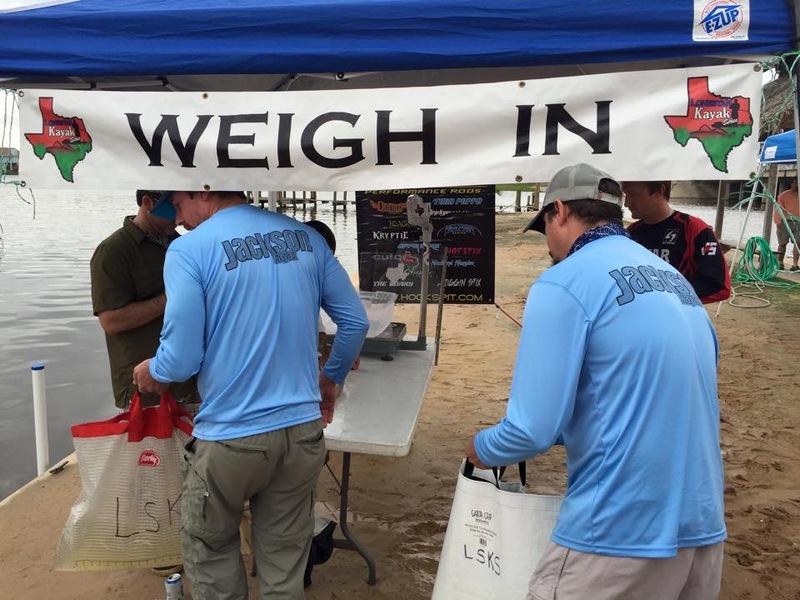 More than 100 kayakers checked in at the weighin and 62 anglers weighed in fish. 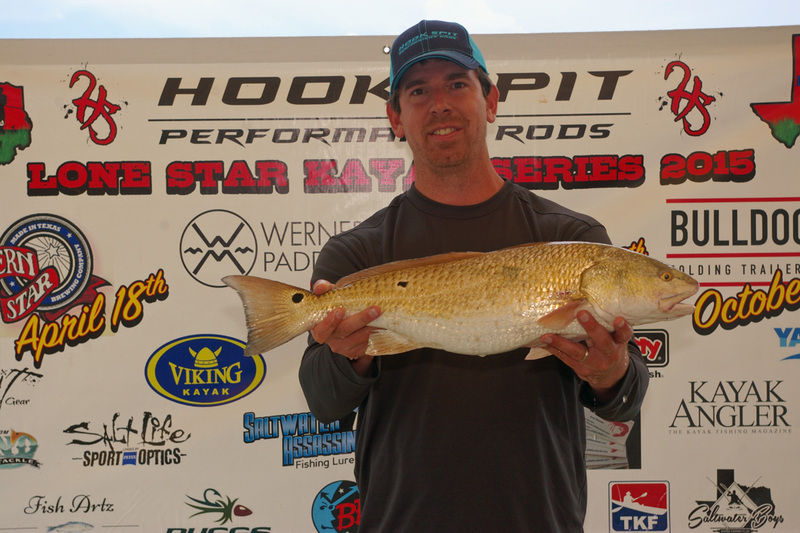 My 23″ redfish put me in 57th place while David’s 24″ red had him finish in 52nd. Definitely not the places or fish we were looking for, but we’ll be back again in June, hopefully with better results. Joe’s winning fish are pictured below. I would like to thank Jackson Kayak, Werner Paddles, Hook Spit Performance Rods, Buggs Fishing Lures, and FishHide Sportswear for all of their support. I have been blessed with opportunity to use and promote these great products and look forward to a continued partnership for years and years to come. 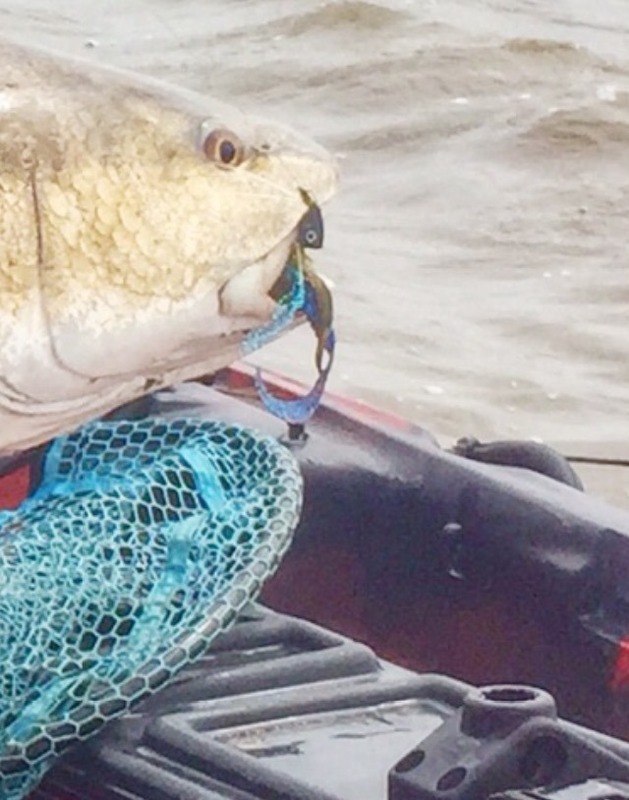 “Match the hatch” is a phrase we fishermen hear all to often, especially when targeting skinny water redfish on the Texas gulf coast in the early spring. Our fish are a bit picky during this time of the year as they transition from their winter homes, with lots of changes occurring around them. Water temps are rising, wind is going crazy, and plenty of fresh water is flowing into the bay from every river, creek, and stream that leads into the bays, due to the excessive amount of rain we receive this time of the year. There are also millions of little baitfish and shrimp hatching in the marsh, with most of these tiny creatures being no larger than your fingernail. With so many tiny meals that are easy to catch, you can expect shallow water reds to develop a little bit of tunnel vision when it comes to what they will and won’t eat. With all of this in mind, I like to downgrade the size of my lure to better match the hatch during the months of April and May. Buggs Fishing Lures are my favorite lures when sight casting to spooky reds. 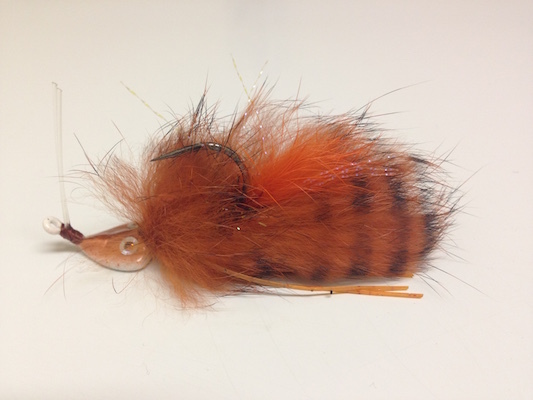 These lures are tied like flies using strips of bunny fur and very small in size. Not only are they similar in size to the current bait, but they also make very little splash when coming in contact with the water. This past weekend while fishing a small marsh lake with an average depth of 1 foot of water, I began blind casting my Bugg after seeing several signs of redfish along the shoreline. It didn’t take more than a few casts before I felt a hard thump, followed by a strong run with a couple dozen yards of drag being peeled off my reel. I knew I had a sold fish, but was surprised to net a 33” redfish after a good 15-minute battle. I hopped out of the kayak for a quick photo and immediately sank to my thighs in the soft mud our marshes are full of. In water this shallow and mud this deep, kayaking is your only choice, with the Cuda 14 my weapon of choice. Big baits don’t always catch the big fish. There are certain times of the year when smaller baits will put more fish in the boat and they are a lot of fun to throw. Next time you’re having trouble with getting a bite, downgrade the size of your bait and see if a lure with a smaller profile is what they are after. 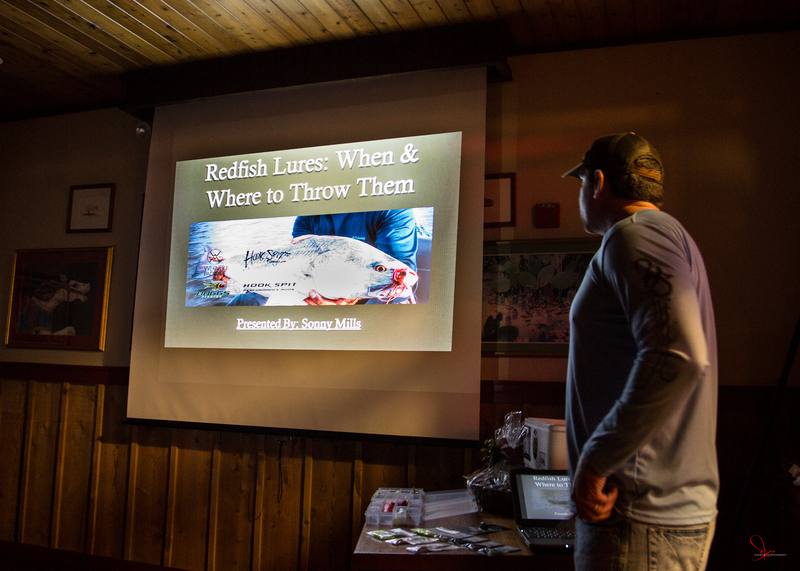 This past Tuesday I had the honor of speaking to the West Houston Kayak Club about my favorite redfish lures. 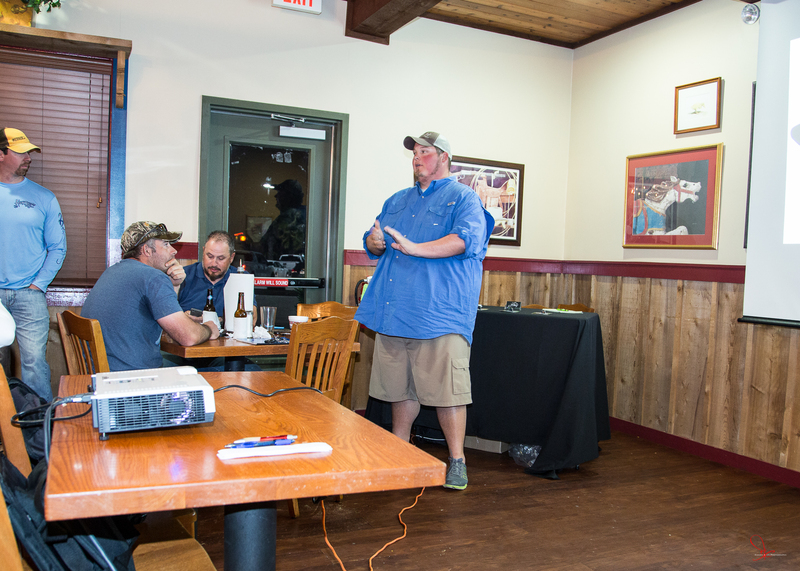 The meeting was held in the banquet room at Spring Creek BBQ in Katy, TX where the club was having their second meeting since forming a few months back. In January, a meet and greet was held to get to know one another and discuss the future of the club with interested members. I assumed around 30-35 people might attend the meeting to see me speak since 15 had attended the first meeting. You can imagine my surprise when the banquet room with a capacity of 65 people was completely full, forcing about a dozen people to stand on the back wall. I was completely shocked to see that 78 people had made the long drive through Houston traffic to hear me speak and I enjoyed every minute of it. The presentation started off with me introducing myself to the group and then telling them a little about myself. I showed them a few examples of the different types of structure I fish on google earth before moving on to the lures, where I explained when and why I use them. After discussing a lure, I would show video footage of me catching a few fish on each of them, while walking everyone through each hookup. 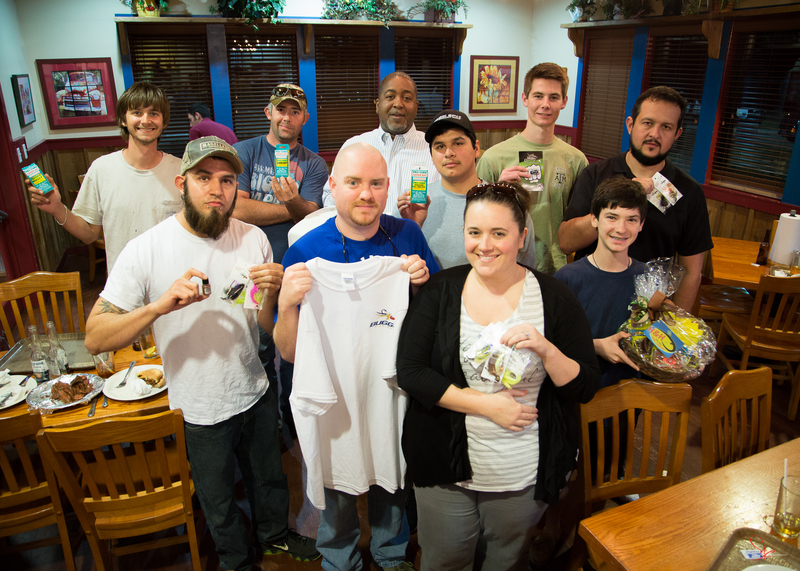 At the end of the night, the club had a drawing where they gave away and Igloo Marine Cooler, a few bottles of Pro-Cure, and a large gift basket full of soft plastics. I was also able to give away two each of the Hydra Buggs, Beastie Buggs, Curl Tail Jigs, and a new Buggs Gator Trout shirt that Buggs owner Heath Hippel had sent me. It was a fun night and I hope everyone that attended went home with a little more knowledge than they came with. Adam and Scott have big plans for this group and I look forward to seeing them continue to grow. Their club will meet on the 2nd Tuesday each month at the Spring Creek BBQ in Katy, TX and anyone that would like to attend is welcome. They will have a speaker each month with Bill Bragman and Andrew Moczygemba of Yak Gear and Railblaza USA presenting at the March meeting. I had planned to try and video the presentation for those who were not able to attend but we had to turn off most of the lights in order to see the projector on the screen. I will try to create a video with a voice over while the slides and videos are shown but it will probably take me some time. The presentation was about an hour long so I will have to find time to sit down and recreate everything I had talked about. I know its a long ways off, but I have already been invited to speak again at the PACK meeting here in Houston on September 15th. 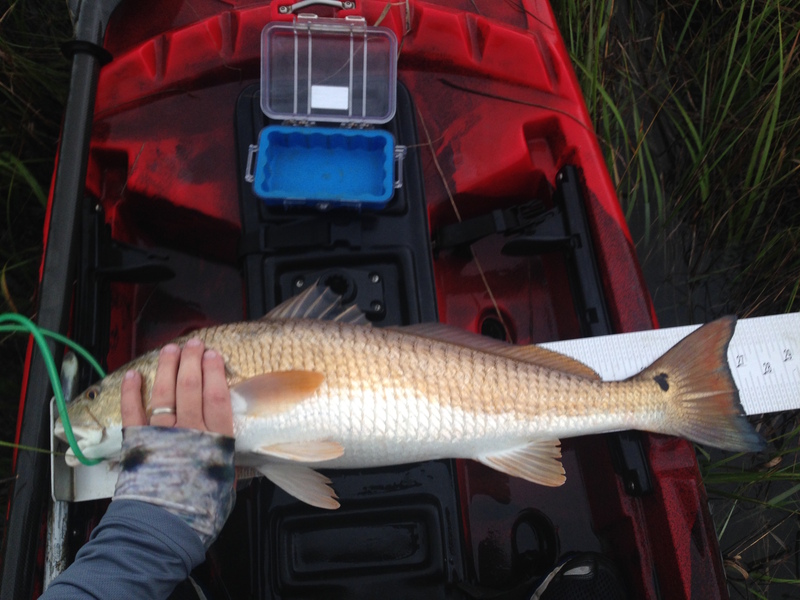 The topic I’m leaning toward is “Signs of Redfish in the Marsh” where I’ll focus on discussing the ways redfish give themselves away in shallow water. If you’re reading this post and attended the meeting the other night, then thank you for taking the time out of your day to come and listen. Thanks to Adam and Scott for allowing me to speak, Heath Hippel for the Buggs, and Robin Janson of Kadien Photography for capturing a few pictures. If you live in the state of Texas and have been thinking about participating in a kayak fishing tournament, then look no further. 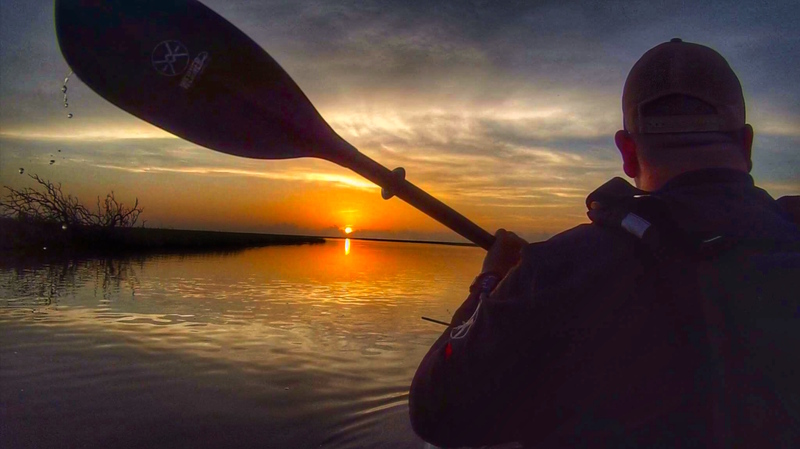 With three successful seasons under its belt, the Hook Spit Lone Star Kayak Series will kick off the 2015 season on April 18th. 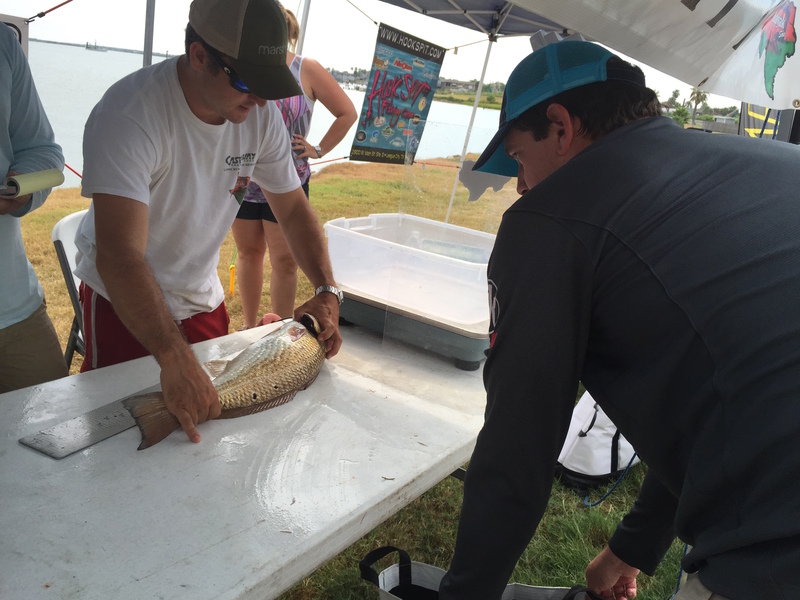 This kayak only redfish tournament gives anglers across the lone star state a chance to compete against one another in a tournament that is competitive, fun, and friendly. Based out of Galveston, TX, the LSKS brings anglers from all over the state together to compete against one another four times a year. Reasonably priced at $65 per event with no captains meeting, anglers simply register online and launch their kayaks at 6:00 am from any publicly accessible launch site between the Sabine and Colorado River the morning of the tournament. Cash payout goes to the top 25% of the field meaning one in four anglers will be going home with cash and prizes from great sponsors like Hook Spit Performance Rods, Werner Paddles, Bass Assassin Lures, and Yak Gear just to name a few. The weigh-in takes place at Louis Bait Camp in Hitchcock, TX where anglers weigh their fish, enjoy free beer supplied by Southern Star Brewery (another sponsor), and share their fish stories about the one that got away. Anglers earn points at each of the four events throughout the season to crown an angler of the year at the final event in October. The 2015 angler of the year will be taking home a new kayak donated by Viking Kayaks along with other great cash and prizes. 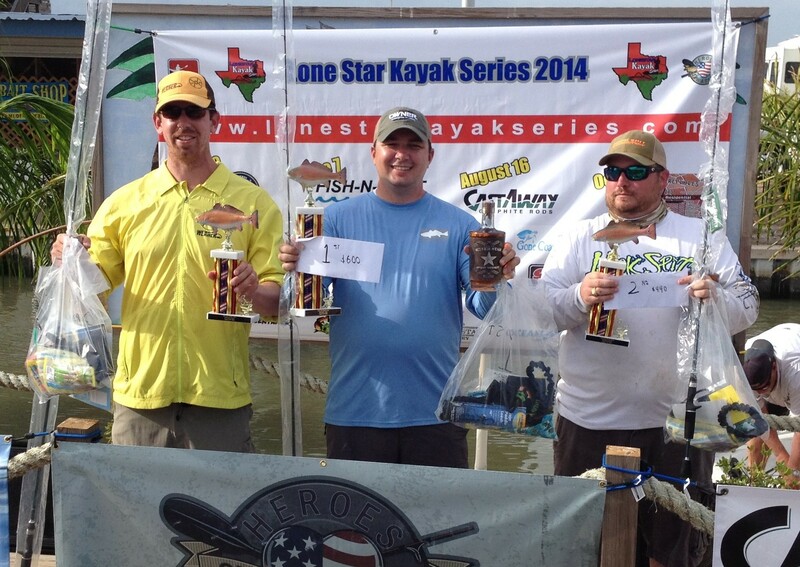 Since its inaugural season back in 2012, the LSKS has become one of the top kayak fishing tournaments in the state. Last April, ninety-one anglers registered for the first event of the season leaving no doubt that hitting triple digits at some point this year is not farfetched. The average number of participants per event has continued to climb over the past three years progressing from 57 to 74 to 78.5 anglers this past season. Although still more than three months away from the first event of 2015, recent chatter around local fishing forums and other social media channels is showing an increase in interest from anglers that are new to tournament fishing. For a variety of reasons, the LSKS is a great event for anglers to make their tournament debut. 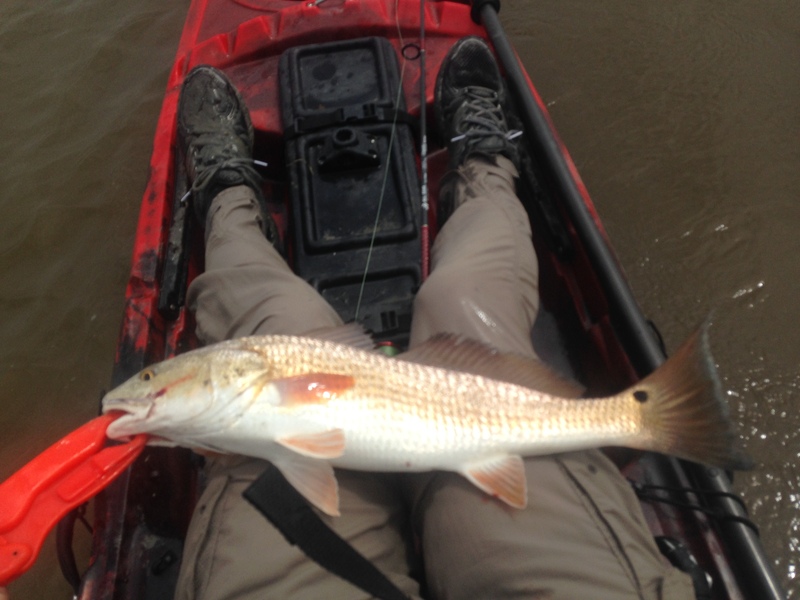 When I first started fishing the event, I was new to kayak fishing and only knew of one location where I could consistently catch a couple redfish. Even though they were mostly lower slot, I was content with the fish I was catching and never felt it necessary to try new spots. It didn’t take long for me to realize that if I wanted to be an actual competitor in the series that I would have to gain more knowledge and explore new areas in search of larger fish. Over the next couple events everything seemed to fall into place. 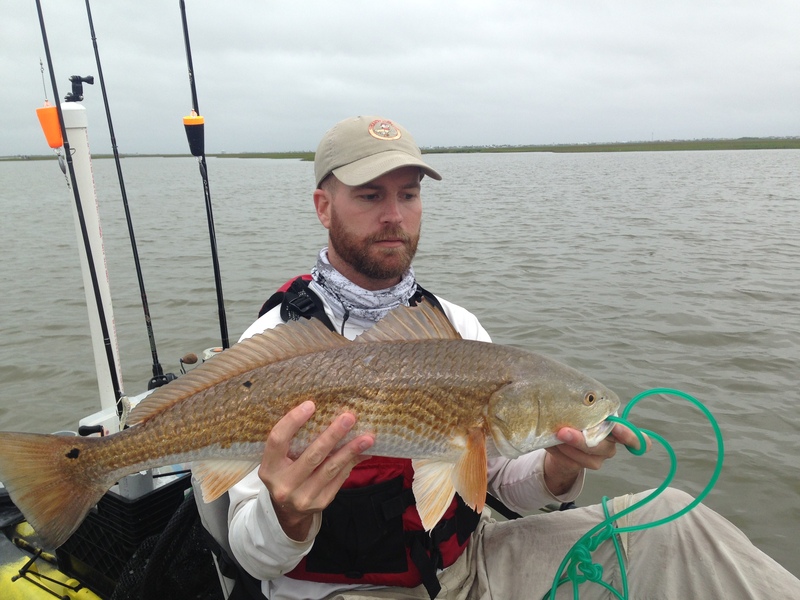 I had discovered several new areas to fish and started noticing and learning more about a redfish’s behavior based on location and structure in an area. Over the next several months, the length, weight, and number of fish I caught began to increase. By the end of the first season I had improved from 7.43 lbs. at the first event, to 12.00 lbs. at the last event, ending my season with a 5th place finish. The following year I took home a first place trophy brining in 14.78 lbs. to the 2nd event of the season. The desire to improve and become a better tournament angler was a driving force in making me leave the comfort of the first marsh I had discovered and search for newer ones with a better quality of fish. The LSKS is also responsible for introducing me to 90% of the people I fish with and consider good friends. The weigh-in basically becomes a three hour meet and greet with more than fifty anglers from across the state sharing stories, putting names with faces, and planning future trips together. Off the top of my head, I can name more than 20 anglers that I have fished with over the last three years that I had never met before the tournament began. Kayak fishing is fun, but it’s even more fun when good friends are involved. 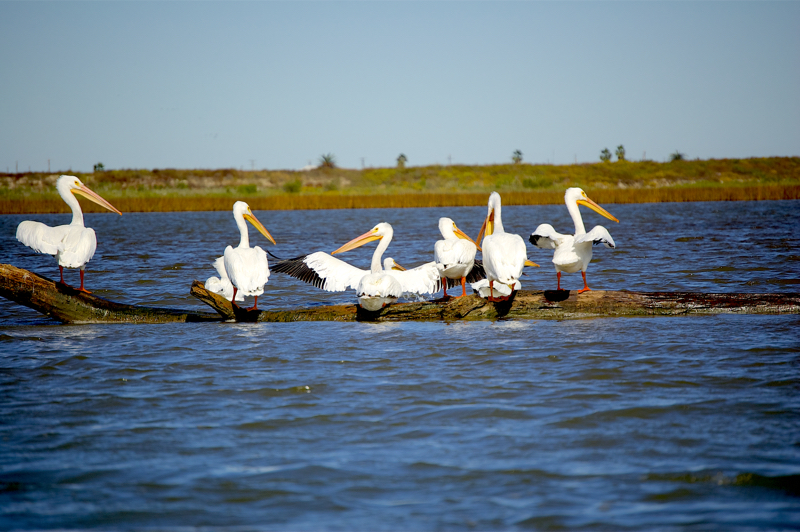 We have anglers that drive in from all over the state including Dallas, Austin, Corpus Christi, etc. Free beer at the weigh-in! Grant and I made a trip to Galveston yesterday to explore a new area and try and locate some fish. I have virtually scouted this spot many times with Google Earth but always seem to talk myself out of making the long paddle that is required to reach and fish it. The winds were predicted to stay relatively low and the temperature was going to climb into the mid 60s by noon so this was as good a day as any to put in some miles. The plan was to search for trout on the way out but they weren’t really around. Once we made the 5 mile paddle to our intended destination we focused on a deeper channel for the first few hours before moving over to the nearby mud/shell mix. We had no luck in the channels, mainly due to the fact that by the time we reached it the sun was straight overhead, quickly heating the mud/shell mix and the water around it. The reds had moved out of the deeper water and were sitting pretty shallow when we found them. All of our fish were within close proximity to the deeper water (4-8 feet deep) sitting in about 2 feet of water with a soft mud bottom covered with a small amount of scattered shell. This has been a constant pattern all winter long that will continue over the next month or two. Find the mud shell/mix near deeper water, and you find the fish. This was one of those days when I kayak you can stand in was key to catching fish. While sitting, the fish were difficult to spot. While standing, you could see them about 10-12 yards away and make a short pitch to them for an immediate hookup. All fish were sight casted and were between 23 and 26 inches. Grant did manage to pull one that was a little over 30 inches for our largest of the day. We also picked up a few trout where the deeper water met up with the shallow stuff and I spotted a 35″ black drum that was not interested in my trout killer. All fish were released to fight another day. Enjoy the video above since I didn’t take any pics on this trip. Weather: Mid 60s with sunny skies. If you live in the Houston area and would like to hear me talk about catching redfish, I’ll be speaking to the West Houston Kayak Club on February 10th. 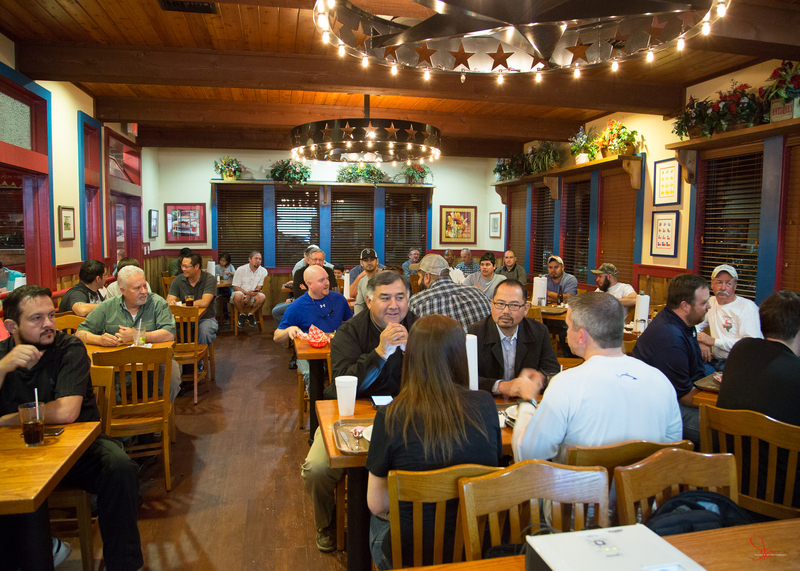 The meeting will take place at Midway BBQ in Kay, TX in the large meeting room from 6:30 to 8:00. 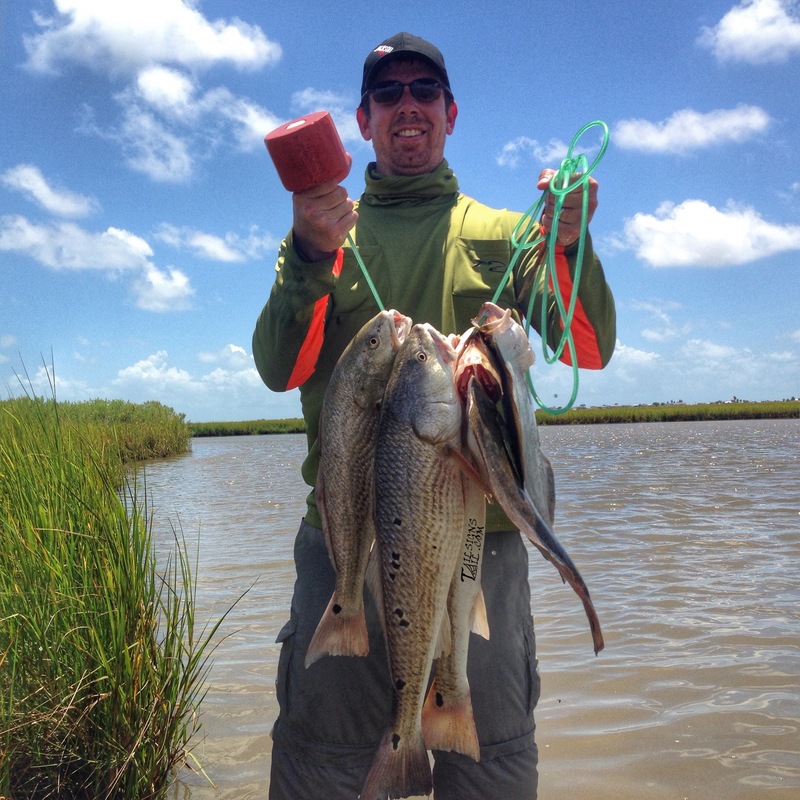 The topic will be “Redfish Lures: When and Where to Throw Them”. 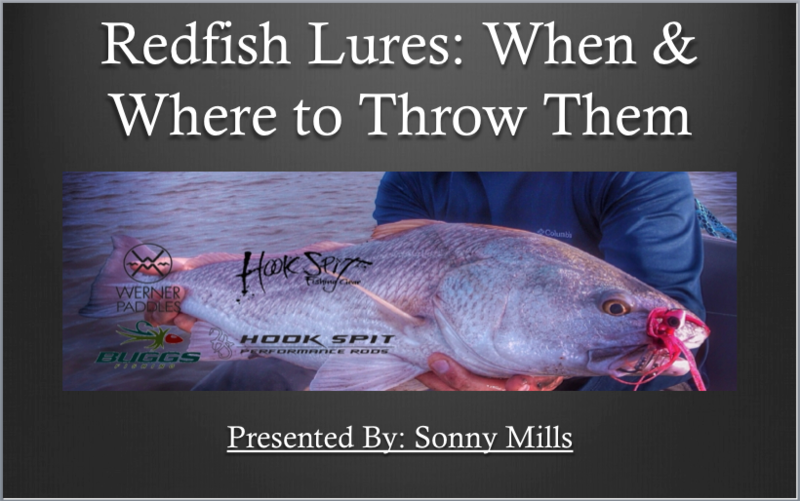 I’ll be focusing on my favorite lures for redfish and explaining certain situations where I like to use each of them along with the reasons why. I have a 32 page PowerPoint presnetation full of pictures, videos, and helpful information from my experiences on the water over the years. Grab a friend, come enjoy some good BBQ, and talk fishing with me for an hour.